Carl Zimmer tackles a common claim about the brain’s fuel consumption. Photographer David Maisel has created a touching project photographing unclaimed cannisters of ashes of ex-psychiatric patients found in an abandoned psychiatric hospital. New breed of video games aim to keep the mind and brain sharp into middle-age and beyond. Studies finds paradoxical effect – people with phobias who ingest a stress hormone seem to be less stressed during anxiety provoking episodes. Get your cyber clich√©s at the ready: brain cells fused with computer chip. New device can indicate the emotional state of a person you’re having a conversation with via a spectacles mounted camera. CrimePsychBlog reports that findings from the controversial ‘replication’ of Zimbardo’s Stanford Prison Experiment are published. Switching between different languages can alter your personality, new study suggests. I’ve just noticed that Christian has written up a great summary of recent research which suggests that people with Tourette Syndrome, a neurological condition that causes involuntary movements or vocal outbursts, have better ‘cognitive control’ than people without the syndrome. This is quite surprising, as at first site, you might think that people with Tourette’s have poor control because of their involuntary movements. In the study, the experimenters assessed cognitive control by asking participants to make quick eye movements to on-screen targets. The participants with Tourette’s could do this far more effectively than the control participants. The fact that people with Tourette’s can do these tasks better than others may be due to the fact that they have a lot of practice trying to control their tics. In fact, it is a myth that they have no control, as some people can ‘hold in’ tics and ‘release’ them at a more appropriate time. Fast eye movements (or saccades) are researched quite extensively as they seem to give an indication of brain function, and can be affected by genetic abnormalities, mental illness and certain drugs (as this review reported, and as Christian’s own research has indicated). A report in today’s Nature describes an association between IQ score and changes in the thickness of the brain’s grey matter through childhood and adolesence. The researchers, led by neuroscientist Philip Shaw, used structural MRI scans to measure changes in the brain, and scanned the same children as they grew up. When the researchers split the children into three groups according to their initial IQ scores, they noticed a characteristic pattern of changes in the brains of the group with the highest scores. The thickness of the cortex ‚Äî the outer layer of the brain that controls high-level functions such as memory ‚Äî started off thinner than that of the other groups, but rapidly gained depth until it was thicker than normal during the early teens. All three groups converged, with the children having cortexes of roughly equal thickness by age 19. The strongest effect was seen in the prefrontal cortex, which controls planning and reasoning. Anything to do with IQ tends to be controversial, as the concept has been used in political arguments (particularly to do with race), and there is much debate about how well IQ tests actually relate to the more general (and more vague) concept of intelligence. Link to Nature news report on study. Link to abstract of scientific paper. “In leading his patients to understand that breakdown was nothing to be ashamed of, that horror and fear were inevitable responses to the trauma of war and were better acknowledged than suppressed, that feelings of tenderness for other men were natural and right, that tears were an acceptable and helpful part of grieving, he was setting himself up against the whole tenor of their upbringing. Men who broke down, or cried, or admitted to feeling fear, were sissies, weaklings, failures. Not men. And yet he himself was a product of the same system‚Ä¶Certainly the rigorous repression of emotion and desire had been the constant theme of his adult life. In advising his young patients to abandon the attempt at repression and to let themselves feel the pity and terror their war experience inevitably evoked, he was excavating the ground he stood on”. The thoughts of army psychiatrist W.H.R. 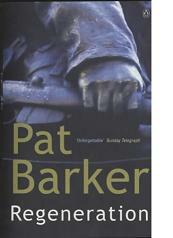 Rivers from the novel Regeneration by Pat Barker. In Regeneration, the first of a trilogy, Barker blends fact with fiction in her depiction of the relationship between Rivers and the celebrated poet Siegfried Sassoon, at Craiglockhart during the First World War. More excerpts to follow next week. The Glasgow Herald reports on the work of neuropsychiatrist Peter Fenwick, who is investigating ‘deathbed phenomena’, the unusual experiences that are often reported by a dying patient or their relatives. Fenwick and his team have just published the results of a study in the American Journal of Hospice and Palliative Care that notes that these experiences are not the result of medication and are relatively common. Furthermore, they tend to be quite diverse and not simply the traditional ‘light at the end of a tunnel’ or ‘friendly figure’ appearing at the end of the bed. Their origin is still a mystery, but Fenwick is running an ongoing research project to better understand the experiences to try and improve care and support for the dying person and their familes. Link to article ‘Visions of the Dying’ in the Herald. Link to website of Fenwick’s research project. Wise words to us all from Luke Jackson, a 13 year-old with Asperger Syndrome, who has written a book full of information and advice for teenagers with the condition called Freaks, Geeks and Asperger Syndrome. If the person asks something like ‘Does my bum look fat?’ or even ‘I am not sure I like this dress’ then that is called ‘fishing for compliments’. These are very hard things to understand, but I am told that instead of being completely honest and saying that yes their bum does look fat, it is politer to answer with something like ‘Don’t be daft, you look great’. You are not lying, simply evading an awkward question and complimenting them at the same time. Be economical with the truth! Link to more information and extracts from the book. The Wikipedia article on the action potential is just beautiful – clearly written and wonderfully illustrated. 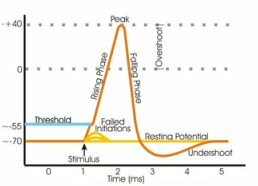 The action potential is the electrical impulse that travels along nerve cells, facilitating communication throughout the brain and peripheral nervous system. The action potential was researched by Alan Hodgkin and Andrew Huxley, who managed to generate equations which explained the process. Unsurprisingly, they won the Nobel prize for their efforts. Link to Wikipedia article on the action potential.